Cody Ross hurt the Phillies in his career so far. His play has inspired a lot of Philly fans to remember all of the key hits that he's gotten off of Phillies pitchers. The Phils management wanted to sign Ross in the off-season this year, but his price tag was too high, and now Cody Ross is a member of the Arizona Diamondbacks. Ross departed the Red Sox as his last team, and here's a video above from ESPN Boston of what changes have gone on with the Red Sox this year, as Ross departs the Red Sox team now and what he was looking for from them. "Could not be happier to be in the Dbacks family! Truly Blessed!" Mike Adams is no stranger to the 8th inning. In his role as the set-up guy for the Texas Rangers last year, Adams appeared in 61 games for the Rangers and entered into the ballgame in the 8th inning in every game with the exception of 7 games. The role of set-up man for the closer is one of the toughest in baseball, often you're coming into the game when the score is very close and it's your job to hold the other team and get the game into the 9th inning so the closer can come in and finish off. The Rangers put Adams to work even when they were up in games as well, to help him keep that rhythm going and to stay fresh. That is the key to a keeping a bullpen fresh, just because you're up in a game don't just assume that a player should just be put up on a shelf to be rested when that is probably worse for them in the long run. Adams doesn't give up the long ball very much either. Since Mike came into the MLB in 2004, he has only given up 27 HR's and that is amazing considering that he's been pitching for so many years now. He's been in the MLB for 8 seasons and in 358 games so far in his career. I like how CSN has adapted some of their interviews with the preface of "Phillies Talk", they seemed to have taken my podcast name and made it their own. 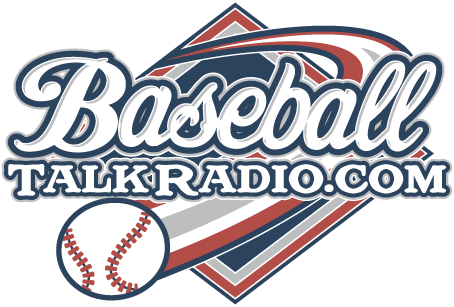 We've been doing a podcast called "Phillies Talk" for years now, so the more the merrier! P.S. - any Philly lawyers out there that think I may have a case of infringement, please email me and we'll sue the daylights out of them! 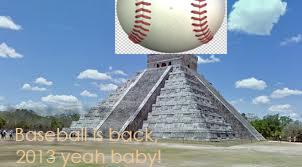 Alright, the Mayans may have been misconstrued or have miscalculated. December 21, 2012 was not the "End of the World" as many people have predicted and talked about over the last year or many years for that matter. Yes, around this area of the country in Philadelphia and the surrounding area, we've seen our share of weather phenomena that we don't normally see that often here in the Northeast. We've had earthquake rumbles, hurricanes, and even what appeared to be a tornado here in the area over the past 18 months or so. All of the signs of severe weather that we normally didn't see were suddenly there, but alas the day of reckoning is here and we certainly don't see any risk in the world coming to an end today. Those of us who have been around a while have been through this before. We've heard the stories of 'Y2K', that was of course the turning from 1999 to 2000 and what events may be triggered by that change of date. There were real worries, advisories and that didn't quite pan out either. Another date that seemed to elicit a foreboding warning was the date of 9-9-99, we sailed right through that as well. What we do know for sure is that the regular season starts in about 100 days, and Spring Training starts well before that. So on this first day of Winter 2012, lets be happy and grateful that we're going to see another great season of baseball real soon. No, we won't talk about the current high priced free agents that aren't all that good and still commanding millions of dollars to play baseball. The impact that has on the rest of the league when it comes to ticket prices, and other players, who are better and are looking for even more money to play this game. We're going to take the high road and try to push all of these concerns aside today, though we'll be keeping a close eye on what's happening in the game, and be thankful for what's to come in 2013 when baseball goes on. It's time for the annual Christmas show podcast, of course talking all about the Philadelphia Phillies. Join Rich and Jim as we have the fireplace crackling in the studio and it's time for yet another holiday podcast talking all about the Philadelphia Phillies. Best wishes and Happy Holidays to all in this festive time of year. We thanks all of our guests that we've talked with and people who listen to the show and hope all of your holiday wishes come true. 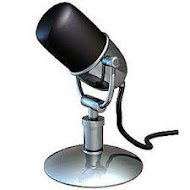 We're looking forward to a great year again in 2013, why don't you make this the year you get an audible.com account, and the best way because they sponsor our podast is to sign up with this link: http://www.audibletrial.com/philliestalk for your best deal to start you off! John Lannan was a good pitcher for the Washington Nationals, now he's a Phillie. There's a lot to like about a pitcher like John Lannan, I always liked him when he was with the Nats, but he wasn't as prominent on the Nationals team of last year, who with talent almost made it far into the playoffs. He's kind of a hold over from the bad Nationals team that we remember of the first few years of their existence, but that wasn't his fault. Why did the Nationals let Lannan walk? That is what I asked myself first when I heard that the Phillies have picked him up for a 1 year contract. John is only 28 years old, and he's got a lot of game in him to play. He's plunked Phillies batters in the past, but I don't think he actually meant to hit them, but now he'll be a teammate and that's baseball. 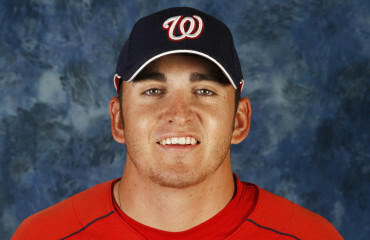 The Nats let Lannan go after relegating him to the minors for much of the 2012 season. He didn't apparently fit in with the Nats rotation after a couple years of being their number 1 starter. He could be the kind of pitcher that the Phillies need in this rotation. Lannan's numbers don't really impress, but we must remember he was on some very shaky teams that the Nationals were fielding just a few years ago, it's unlikely that any pitcher would have looked too good with those types of teams behind them. This signing almost reminds me of the time that the Phillies signed another bargain that they let slip away. That of course was the current free agent but former Cardinals pitcher, Kyle Lohse. Lohse just happened to go 16-3 with a 2.86 ERA last year. I remember when he was with the Phillies, he was only one of a few players that would be out signing autographs for the people who lined the railings to say hello and get an autograph. The Phils also bring in a player named Mike Adams into the bullpen. Adams looks like a good candidate to fill the role of set-up man. The Texas Rangers passed on the chance to give Adams a multi-year deal and the Phils stepped in and offered up a 2 year deal for $12M. There were others involved in wanting to sign Adams, but he wanted to come to Philadelphia. The last piece of the puzzle appears to be Cody Ross. Yes, the guy the fans loved to hate and for good reason. All he did was hit Phillies pitching, just about everytime he was up at bat. What else can we do now except to ask him to join us? We'll see how that works out, but the Phillies now appear set to get ready for contend when they do arrive down in Florida for Spring Training for 2013. The Phillies home games this Spring Training season in 2013 have been announced, and yes, it's only right around the corner. We have a couple winter months facing us, but in no time, the thoughts will be turning to Spring Training 2013. The schedule at home starts right off with the newest addition to the American League, the Houston Astros. So let's think Spring for a while, and those thoughts alone will begin to warm us up a little with thoughts of grapefruits and baseball. The Phillies have made some strides to repair the areas where the team needed help. The last piece of the puzzle though is the bullpen, and the Phils still need a whole lot of help there. In acquiring the Phils newest third baseman, Michael Young, the team also traded away a piece of the bullpen in Josh Lindblom, who came here from the Dodgers in the Shane Victorino deal. Nate Schierholtz was not offered a contract from the Phillies this off-season. The Phillies traded one of their top offensive producers in Hunter Pence and now have nothing to show for that trade either. The moves made by Ruben Amaro so far have not addressed this glaring need for the Phillies, they can't operate in the bullpen the way they did last year, as a lot of games were lost by the pen. We'll see what happens as the winter season sets in. The Phillies have themselves a new third baseman. 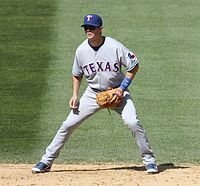 He's Michael Young, formerly of the Texas Rangers, and he comes to town with a 'no trade clause' no matter what the circumstances in fact he had the same clause with the Rangers but he approved the trade to come to the Philies. Young is a 7 time All-Star and has been in the MLB for 13 years and last year he turned in one of his worst seasons ever in terms of production despite having 611 AB. What Young is capable of is better things than he did last year. His batting average dipped to .277 on the season last year, but prior to that it was over .300 or just near there. His power stats dipped too, he finished the season with 8 HR and 67 RBI on the year. The year before he had 106 RBI and 11 HR, and in 2010 he had 91 RBI and 21 HR. Young has been highly paid in the last two seasons as well, making $16M last year and $16M the previous year and is owed $16M in this upcoming 2013 season. The baseball salaries are again making a crazy swing upwards with a lot of players this year, no telling when this will all end. Baseball tickets are already high, and the Phillies have sprung a new way to price games on the fans this year, as we'll find out that you'll be paying more to see certain teams than others if you don't have a season ticket plan that is. That is the subject of another post though and it's great to see that the Phillies have started to at least fill some spots on the roster that are needed. The signing of Young kind of puts a damper on Kevin Frandsen's signing earlier in the off-season by the Phils. Frandsen looked like he was ready to step up and play third base for the Phillies this upcoming year. Kevin was signed last month for 850K, and in 55 games with the Phillies last year, seemed like a player that was out there producing. Now Frandsen's status with the Phillies may be relegated to bench player, unless Young gets injured at some point next season. Ruben Amaro has been out searching for a big fish to land, as the Phillies again want to keep hunting for high priced free agents to fill their needs rather than focusing on young talent and bringing that talent to a higher level. This may be the last year of this style of bringing in new players though if the Phillies don't make it to the World Series again. Ownership has spoken many times this off-season that Amaro 'has his work cut out for him' and perhaps this is the first signal that all of these high paid free agent signings will be stopped. It depends on fan support though, if the fans keep supporting the team and keeping the money flowing, Amaro can continue his spending spree the likes that have never been seen in Philly in any prior period of time in their history. We'll see if Young can have what it takes to make the kind of contribution to the Phillies that the team needs. At 36 years old, players are not the same as they were just a few years prior. It's a blockbuster trade, two solid pitchers to the Twins and we're getting a center fielder after much perusal of the open market. Gone are the fan friendly Vance Worley, whom everyone seemed to have liked and respected, and a top prospect pitcher for the Phillies, Trevor May. The Phillies are getting in return that center fielder Ben Revere from the Twins, who is a younger guy that has power in patrolling the outfield, not really all that well known as of yet. Lenny Dykstra was a gung-ho center fielder that got the job done and then some in center field for the Phillies and the Mets in his 12 year career as a Major Leaguer. "Nails" was his nickname and he was like having a linebacker from a football team playing center field and he could hit. Yes, the later stages of his career may have been fueled by steroids, but Dykstra had that inner inertia that just exuded energy. Lenny was drafted in the 13th round of the amateur draft in 1981 by the New York Mets as a 22 year old rookie. He finally made it to the big leagues in 1985 for the Mets, and in 1986, we all know that the NY Mets won it all, their first World Series and Lenny did very well. For the Phillies, he probably would have been the World Series MVP of 1993, if the Phillies had won, he hit 4 HR and had 8 RBI in the World Series that got away from the Phillies. Dykstra's career year was in 1993, he worked 129 BB, and produced 191 hits on the season, while putting in 637 AB. He was like baseball's iron man, someone that didn't seem real. Well, the truth was he wasn't 'real' as he told many years later, Lenny admitted that he was one of the first to start dabbling in steroids. He wanted to be big, bad, and in charge. Well, he became all three with the help of body building steroids that seemed to run rampant in Major League players circles, and even the gym scene across the country. It was new, enticing and little did anyone realize or probably care how bad it was for you to take them, the edge of keeping your job as a well paid major league player was the enticement for plenty of players to do them. Dykstra cashed in with a nice contract at the time with the Phillies a three year $24.2 Million dollar deal that took him to the end of his career in 1995 and should have set him up for life. 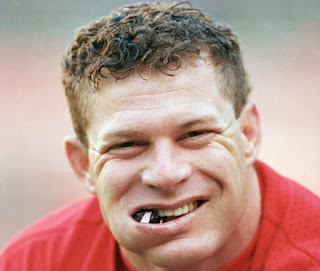 Now, many years later, Lenny Dykstra is almost facing life, life in prison that is. The career in baseball long gone, Lenny had turned to multi-millionaire investor and advisor and someone that could not go wrong, until the economy and bad investment deals started to collapse and fall all around this former center fielder like a house of cards. Dykstra started some businesses right after his playing career. They were pretty successful, plenty of car washes and lube centers in Southern California. This was just the start of something big that Dykstra that always was seeking. The road of success drove Dykstra to Wall Street, he learned all about business and investing and then started to associate himself with other well know investment advisors who proclaimed that Dykstra had a real business talent. Dykstra's successes in business were about to turn though, just as the economy was about to tank in the United States in 2008, the tailspin for Lenny also was about to begin. He lived large on the success he had in a short time in the business world, but just as large as his success, the equal force of his failure was about to nearly consume him. It started with his investments, two multi-million dollar homes were purchased in California. One of those used to belong to Wayne Gretzky, and then nails bought into the neighborhood. His stay or ownership really didn't last that long, as Lenny declared bankruptcy in September of 2009. His financial empire was collapsing in ruins, and Dykstra didn't help matter either, allegedly abusing drugs and drinking as was talked about by many who knew him and were concerned for him. Already serving 2 1/2 years for bankruptcy fraud, Lenny now gets an additional 6-12 months for his most recent conviction just yesterday for hiding some personal memorabilia from his playing days from the bankruptcy court. That is relatively light to what he could have been sentenced to. Dykstra may be his own worst enemy though, if he doesn't sort his problems out by the time he leaves jail. The off-season is a perfect time to catch up on the baseball book reading. If you follow the blog, you'll already know that a couple weeks ago, we reviewed Gary "Sarge" Matthews book called "Few and Chosen: Defining Phillies Greatness" and talked with Sarge on the Phillies Talk Podcast (which you can find a player for right here on the website under 'Podcast' or find it on iTunes, Android, or Stitcher Radio). That book is a great read for Phillies fans. 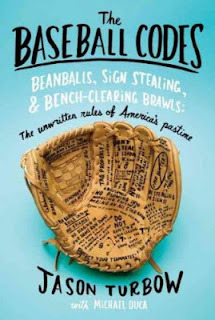 This month I'm reading a baseball book, called "The Baseball Codes: Beanballs, Sign Stealing, & Bench Clearing Brawls." The book was originally published in 2010 and it was again published by Anchor Books in March of 2011. 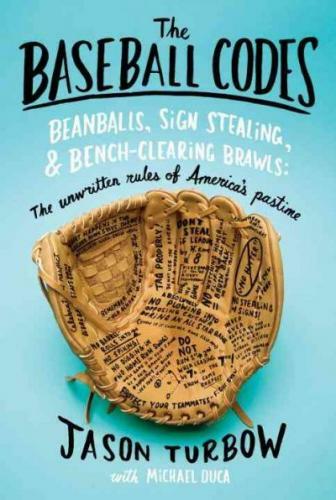 There is also a blog that is continually updated with new articles that may make it into a future edition of the book called www.thebaseballcodes.com. The book is written by Jason Turbow with Michael Duca, and it is a look at what goes on during a game that doesn't get that much attention on a broadcast of the game. The silent code of baseball players, that sometimes leads to beanballs, and bench clearing brawls. Yes, even the Phillies were accused of sign stealing a few seasons ago, bullpen coach, Mick Billmeyer just happened to have a handy set of binoculars with him out in the bullpen and was having a look around at what the opposing team was doing on the field. All was great with that of course until someone noticed him doing that. The book is a fascinating tale of what happens in the game when things get out of control. It chronicles several well known brawls and what happened to cause them. Players like Nolan Ryan, Roger Clemens, Mike Piazza, Don Sutton, and more are all in the book. Colorful tales of managers like Tommy Lasorda, and Ozzie Guillen sprinkle in more ingredients that sometimes added to some of these incidents. A great read and this book gets a double thumbs up from FightinPhillies.com and be sure to check out their website for the book too, as it always gets updated even in the winter months. Somehow the BBWAA must deal with this, but how? Baseball has done a good job of dealing with the steroid issue, largely they have done this by just avoiding the question and problem almost exclusively. There were inquires, Congressional hearings and much more. The reports are out, the words have been spoken and now there are a few players that are up for vote to enter the Hall of Fame. It is now the BBWAA, Baseball Writers Association of America, to sort out all the sordid details of many players now to become eligible for entrance into the Hall of Fame and what they will do about it is anyone's guess. There were no rules laid down by the MLB in reference to this, and it's every writer for themselves, as they try to settle the question that a lot of fans have some opinions about. 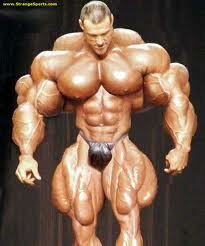 Some are for certain players, and some are against the notion that players that have used steroids to a large extent, are now up for election to the Hall. Curt Schilling, who is on the ballot, feels that the 'big 3' on the ballot Barry Bonds, Roger Clemons, and Sammy Sosa, should not be voted for in the vote for the Hall of Fame. Schilling gave his comments to ESPN, who he works as an analyst for. He went on to say that he was proud that his numbers were earned in a steroid free way, and were all earned without cheating. He said also that it would be interesting to see what happens with this vote. The winners, who must receive at least 75 percent of the vote to make it, will be announced on January 9th, 2013.